National Institute of Ocean Technology (NIOT) has released a notification for the recruitment of 203 Project Scientists (I and II), Project Scientific Assistants and more. Interested candidates may check the eligibility criteria and apply online from 03-10-2017 to 30-10-2017. For Project Scientists I & II :- Candidates should have passed Bachelor’s Degree in Engineering in relevant discipline OR Master’s Degree in relevant discipline from a recognised university. For Project Scientific Assistants :- Candidates should have passed Bachelor’s Degree OR Diploma in relevant discipline from a recognised university. 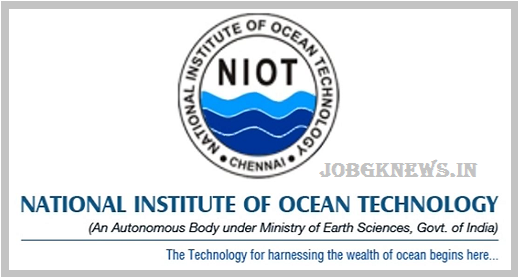 How to Apply :- Interested and eligible candidates may apply online through NIOT website - https://www.niot.res.in/ - and hard copy of registered online applications should be sent to The Director, National Institute of Ocean Technology, Velachery-Tambaram Main Road, Pallikaranai, Chennai–600100, INDIA from 03-10-2017 to 06-11-2017.